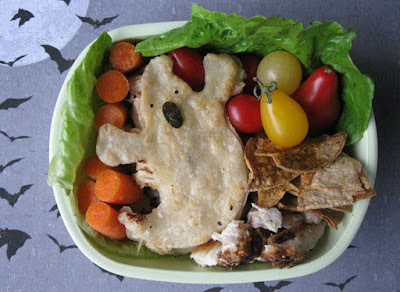 This bento goes bump in the night. :) A ghost quesadilla filled with cheese and chicken. I used a cookie cutter to make the ghost shape, then put cheese and chicken inside to make the quesadilla. Also in this bento: baby carrots, cucumbers (hiding under the ghost), cherry tomatoes, baked tortilla chips (made with leftover scraps from the ghost tortilla), and more chicken. Clever! Cute ghost. That's cool about the food bank raffle! Cute ghost!!! ... and that's so cool about the bank raffle, hope you'll win a cool wine road package! Thanks Lia! I used a small hole punch to make the eyes. I tried larger eyes, but they were actually too scary. Smaller eyes is kawaii!